Ahh, fish and chips… the one dish we're glad made the jump from the British Isles (if only they could send over their pubs...). Whether it’s your Lent special or a go-to comfort food, here are the 12 best fish and chips to catch in Boston. 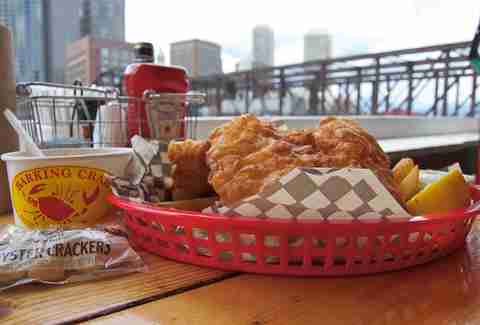 This waterside crab shack knows seafood and it knows how you like it: fried. The Barking Crab’s generous fish & chips is everything you want it to be: golden-brown haddock floating on a raft of equally golden-brown French fries with a side of house tartar sauce. Feel free to mix in the Crab On Fire signature hot sauce. The Bancroft is a well-known red-meat mecca, but its surf is every bit on par with its turf. Available during Sunday Supper only (5-11pm), the Fried Haddock Fish N’ Chips is a lightly breaded wonder jazzed up with house-made herb tartar sauce. Crispy fries come with a zesty house-made ketchup and roasted Brussels are along for the ride, because vegetables. Modest seafood restaurant in the front, nationally known fish market in the back. Since 1950, Yankee Lobster has been feeding the locals hearty regional specialties like clam strip rolls, fish stew, and fried oysters. And then there’s the coveted (and remarkably inexpensive) fish & chips. The gurus here fry up pollock and coated taters, resulting in big-time crunch from start to finish. Feeding mega-hungry sports fanatics requires generous portions, and the Cask definitely keeps the Green Monsters satisfied. 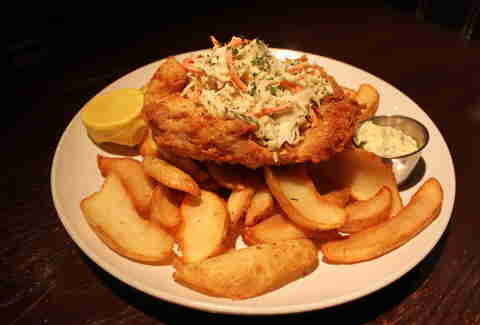 The Fenway mainstay fish & chips has Harpoon IPA-battered haddock perched on wedge fries, then topped with homemade slaw. The walk-off: Deep-Fried Twinkies with salted caramel ice cream. Boston’s only true Japanese izakaya restaurant rolls some serious sushi (and less serious sushi pizza), and its expertise with finned fare doesn’t stop there. From the well of deep-fried tapas, the Itadaki Fish & Chips heads east with a tempura-inspired batter and a side of signature Itadaki Spicy Fries garnished with a flower (sooo Zen, man). You’re also getting Panko Fried Oysters with tartar and tonkatsu sauces. The resurrected Rosebud is back and better than ever, and it's cranking out major comfort food, Southern and otherwise. As a Shyamalan-style twist on fish and chips, Rosebud dunks Acadian redfish in ‘Gansett batter for perfectly puffy results. Crunchy thin-cut fries, house tartar, and house slaw seal the deal. As always, save room for pie or Jack Daniel’s Caramel Banana Parfait. Emmets, the Emerald-Isle annex nestled in Beacon Hill, pours a mean stout and fries an even meaner fish & chips. 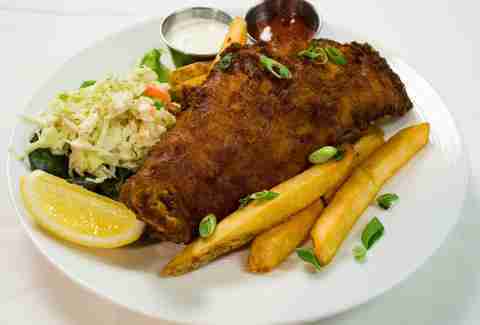 Your plate o’ gold is covered with beer-battered New England haddock, “skin on” steak-style fries, slaw, and tartar sauce. You’ll also want some Irish Potato Skins, a dynamite combo of skins crowned with shepherd's pie mix. 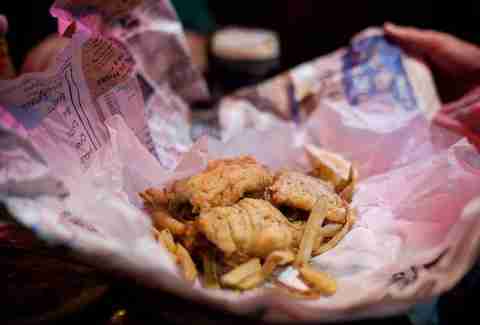 The original J.J. Foley’s has been around since 1909, so it's doing something right, namely its fish & chips. Settle into a well-deserved pint and indulge in the talked-about Beer-Battered Filet of Haddock and house-cut fries with slaw, tartar sauce, and lemon. Balance things out with a plate of deep fried Mac n’ Cheese Bites. This ain’t your Uncle Declan’s fish and chips. The popular Pan Asian spot pulls out all the stops for its platter, and it's so good that it resides on the Chef’s Special menu. 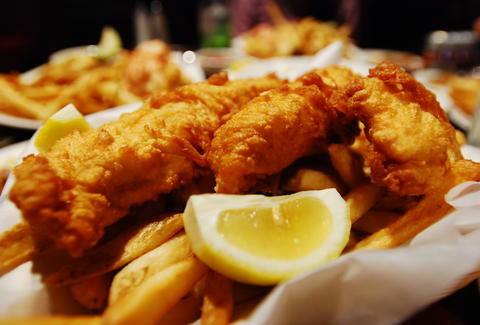 Carefully selected whitefish are coated in JP Seafood’s famous extra-crispy batter and fried. The homemade coleslaw, bright and fresh with delicate seasoning, takes the familiar (and sometimes ignored) staple to the next level. Inman Square’s highly regarded, authentic Irish pub offers an homage to this classic dish. Fresh cod and hand-cut fries take center stage in the Druid Fish & Chips, and then house tartar and the traditional “wrapped in newspaper” presentation steal the show. Suggested pairing: beer. The ICOB team's fish & chips achieves an ample crunch thanks to a surprisingly light beer batter, but it’s the Malt Vinegar Aioli that puts this paper-lined basket of goodness ahead of the pack. Match it up with an exclusive ICOB Pils. Matt Murphy’s is the quintessential laid-back neighborhood hangout, and this IS your Uncle Declan’s fish and chips (or, as the pub calls it, Crispy Cod and Chips). Rabidly defended as the best in town, Matt Murphy’s rendition is real-deal authentic -- again, wrapped in newspaper -- with the added zippy contrast of pickled onions and malt vinegar. Sign up here for our daily Boston email and be the first to get all the food/drink/fun the Hub has to offer."